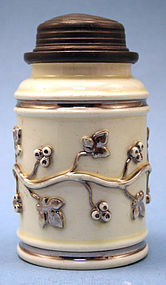 A Rare Stoneware Wine Flask (called a “Schraubflasche” in German), cylindrical with a pewter screw top, sloped shoulder and white glazed body with applied silvered decoration of a scrolling branch with leaves and berries. Silvered underglazed mark on base. Antique English Sheffield plate tantalus with three stoppered cut crystal decanters. Mid 19th century. (minor wear to plate, minor chips to rims).